A once in a lifetime film experience. 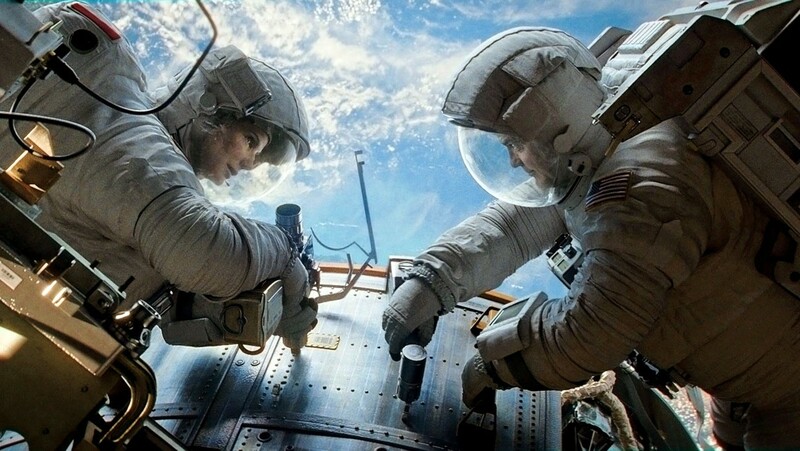 Gravity is a directorial tour de force by Alfonso Cuaron (“Children of Men”) who has come up with a realistic mission-gone-wrong outer space picture that’s original – it won’t be repeated. George Clooney and Sandra Bullock headline, but it is Bullock who we intimately identify with in what is the best performance of her career. It’s frosting on the cake that we get a character to care about, because without even considering the performances this is a fantastic visual experience that has found ways to compare to “2001: A Space Odyssey” (1968), the mother of them all. What’s amazing ultimately is that it has found ways to shoot outer space in its own singular way. Yes, Cuaron has pulled that off! Amazingly! There is no “plot.” Just a situation, a fight to survive once marooned in space. Bullock’s Ryan Stone and Clooney’s Matt Kowalski are working on a routine repair on a U.S. shuttle, with a third astronaut we don’t quite see. We hear light-hearted talk via radio channel between Matt and mission control, while Ryan the engineer – on her first career spacewalk – is more quiet and focused as she meddles with a panel on the outside of the ship. Ryan has a safety rig on, while Matt zooms around with his jet-pack. Then an alarming message comes in to abort the mission, following reports that a Russian satellite has blasted and dangerous debris will be orbiting (at high speeds) their way. Nearly 17-minutes or so of the opening are done with one solid, unbroken shot – the camera breezily, as well as majestically, maneuvering around the action. The chunks of broken steel come their way, smashing and destroying their spacecraft, breaking their tethers, and sending Ryan to spin in perpetual vertigo into space. We are told of the length of how much oxygen is left for her. Matt reaching her on his jetpack is her only hope. 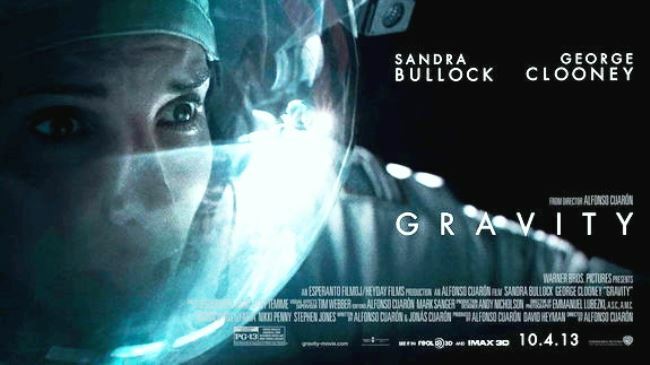 Majestic surely is the operative word to describe the splendor of “Gravity,” but spellbinding suspense is the most appropriate description. Cuaron uses his best sensibilities to make his film feel like it’s unfolding in real time. “I’m going to die today,” panics Ryan, who binds herself close to Matt. The refuge, for both of them, in open space turns out to be an international space station, that will also be damaged shortly. And also a Chinese space capsule with landing capabilities is at another distance. Along the way, a Murphy’s Law of disasters topple one after one, as if to demonstrate all that could go possibly wrong. No wonder NASA astronauts never accomplish much! Spacewalks are clumsy. Things fly at your head at zero gravity. Opening an airlock in re-entry is frighteningly difficult if you lose grip. You take away short oxygen and add flying debris, and it’s terrifying. But take a look at the mellow optimism of Matt, and how Ryan learns to take some of that hopefulness to keep her sanity. First lesson, really: If you want to live, there must be no more panic. 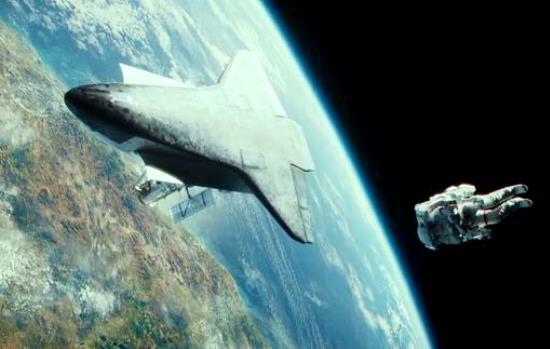 “Gravity” employs the best, and truly greatest special effects, that are possible by modern standards. And I declare that because they are not detectable special effects. They don’t announce themselves as special effects. Yet the next Oscar winner for Special Effects will probably be some over-fused J.J. Abrams digital spectacle. But what’s special ultimately is the beauty, all done with mostly fluid camera movements and few cuts. The final images are as beautiful as anything I’ve seen in a lifetime. Alfonso Cuaron is a visionary, and while other Hollywood films would have crammed in some pedantic “verbal” conclusion, he has found a way to come out pure. Film Cousins: “2001: A Space Odyssey” (1968); “The Right Stuff” (1983); “Apollo 13” (1995); “Contact” (1997); “Mission to Mars” (2000).